“The EAT Jo No.5 MC Cartridge is the best overall performing MC cartridge I have heard in a long time, and the current “price/performance value” of the decade…at $1295, it challenges my favorite $3500 cartridge reference for best overall definition, imaging, and musicality. I cannot even suggest a cartridge at Jo’s price that comes close in overall performance. This cartridge is a 'must have' upgrade for any tuntable. The Jo No.5 is an elegant masterpiece, both sonically as well as visually. The cartridge body and stylus guard are made of Polyamide produced by an additive manufacturing process which is called Selective Laser Sintering (SLS). This process sinters thin layers of powder with a laser to build the final structure. It comes in unmistakeable mint green color and features a truthful and immersive sound stage. 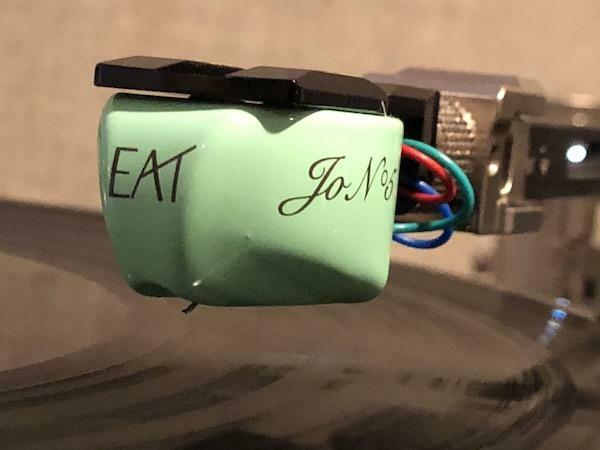 Seriously though, E.A.T.’s new JO No 5 is the European Audio Team’s second cartridge and rather than being a “revolutionary” design, it’s one that makes use of well-known technology and parts and its built by Ortofon to E.A.T.’s specifications. As many of you know, the E.A.T. brand belongs to Jozefina Lichtenegger, wife of Pro-Ject founder Heinz, whom I’m told had a strong hand in this cartridge’s design. See review of E.A.T. B-Sharp turntable. Ortofon’s Selective Laser body building techniques (SLM-melting using metal, SLS-sintering using Polymide plastic) allows the company to produce a wide range of body shapes. If you watch the interview I conducted at Munich High End 2018 with Leif Johannsen, Ortofon’s Chief of Acoustics and Technology, you’ll see him dump out onto a table a bag of possible SLS produced cartridge body shapes or more accurately, enclosures for the basic square Ortofon Quintet series body. As with the Quintet line, which uses various combinations of styli, cantilevers, coils and magnet systems, OEM customers can do likewise. 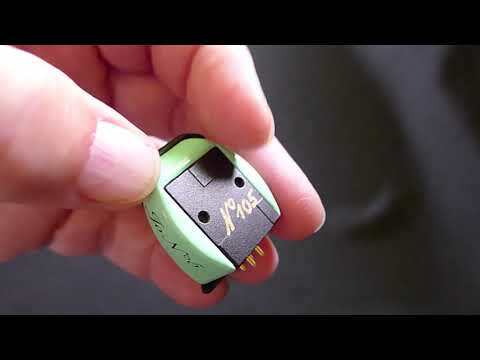 So, though the No5 is based on Ortofon’s Quintet Black, the Lichteneggers spent time auditioning various combinations of parts to determine the final sound of this cartridge, which is also affected by the shape and mass of the outer curvaceous body finished in delicious looking minty green. You can say “looks don’t matter” but this is one cartridge that’s difficult to not want to just stare at! More importantly, it’s a cartridge that makes it difficult to not want to just listen to. The JO No5 combines the richness and warmth of some other modestly priced MCs with a good deal of the detail and resolution produced by more expensive MCs with not a hint of the added edge, etch or grain that sometimes mars the performance of modestly priced MCs. Plus it’s a very good tracker, smoothly sailing through lateral 80 μm peak track 13 on Ortofon’s test record. While the No 5 is based on the Quintet Black’s body platform (hidden by the hard outer shell) it differs in many ways. The standard Black features a Boron cantilever and Shibata stylus. The Noo 5 uses an aluminum cantilever to which is affixed a “Fine Line” stylus. The coil windings of 4N copper are different, the rubber suspension alignment is different and the compliance is somewhat lower to make it more compatible with E.A.T. Tonearms especially the C Note. Like the Black, the Quintet’s output is .3mV and internal resistance is 5 ohms, with recommended loading at 20 ohms. E.A.T. claims each cartridge is hand- selected and that means some don’t make the cut. The price is $1395 in the attractive wooden box, or $1295 in a simpler cardboard box. There’s also a discount packaged with an E.A.T. turntable. I played symphonies 3, 5,7 and 9 of Sir Simon Rattle’s Beethoven Symphony cycle with the Berlin Philharmonic (review coming up) and found the sound rich, enveloping, harmonically “colorful” and spatially involving (it was recorded digitally with a pair of M/S microphones). Enough bite to the brass, with particularly full-bodied French Horns and super-stable imaging. It's also the cartridge I used to listen to the female vocals double LP I just reviewed and found it fully satisfying. Whatever the No 5 didn't do, I didn't really miss. In other words the No 5 never sounded like No 2 (sorry I couldn't resist). The No 5 manages to be both rich sounding and exciting. Never snooze- inducing or “soft”. Definitely a fuller, richer, “meatier” sound that I remember from the Quintet Black, which was also relatively “full bodied” for a $1000 MC cartridge. Here you pay a little more and you get more fullness without paying the price of sludgy bass or rhythmic constipation. Yes, you can get faster and leaner performance elsewhere and for that matter, warmer and softer too. I found the E.A.T. JO No5 to provide an ideal balance between the two. It certainly is no match for the super-costly “super cartridges” out there now, but considering the price, it leaves very little on the ‘table and it’s among the best looking transducers you can buy at any price!